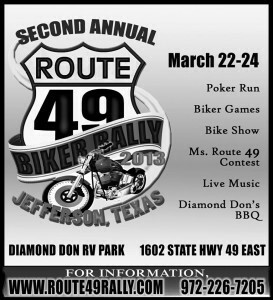 The spring weather is the optimal time of year to get out on your motorcycles for a ride to Jefferson Texas. 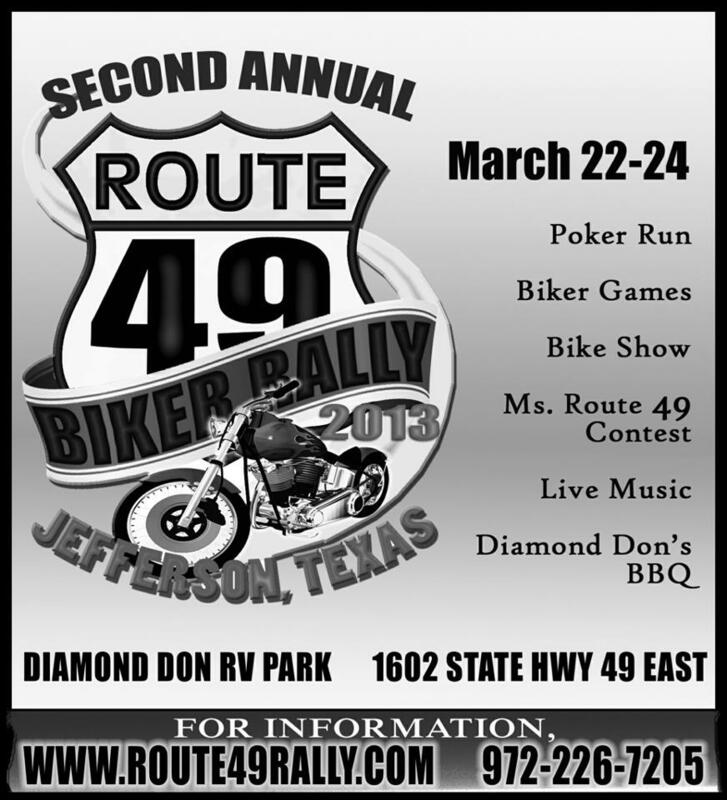 The 2nd Annual Route 49 Biker Rally is just a few weeks away and this year’s plans are bigger and better than the last one. I hear there are some Rock’n bands planning to attend for your pleasure. A gorgeous 2001 Harley Davidson 883 Sportster® Custom Motorcycle being raffled off this year. Get your tickets in for that beauty. I found this older video of Chris LeBlanc who will be playing for the crowd during the rally. He is just one of the bands playing during the weekend. They have a new ROUTE 49 RALLY BUS they’ll be using during the rally to transport bikers at no cost to and from Bed and Breakfasts and Hotel’s in Jefferson to the Rally Site! That will really make it easier on transportation and parking. Everything begins Friday March 22, 2013 with registration, meet and greet BBQ for pre-registered attendees and then live entertainment. The whole weekend is filled to the brim (helmet brim that is) with lively entertainment, a poker run, talent contest, biker games and of course a Bike show and much more. For the best up to the minute bands, changes and activities please visit the Route 49 Rally website. We will find out about the transportation to and from the White Oak Manor bed and breakfast before you get here for the weekend. This entry was posted in Biker Rally, Spring Events by Tammy D. Bookmark the permalink.